The Arc table by Julie Begtrup and Ditte Vad for Woud is available in different sizes as couch- or side table. 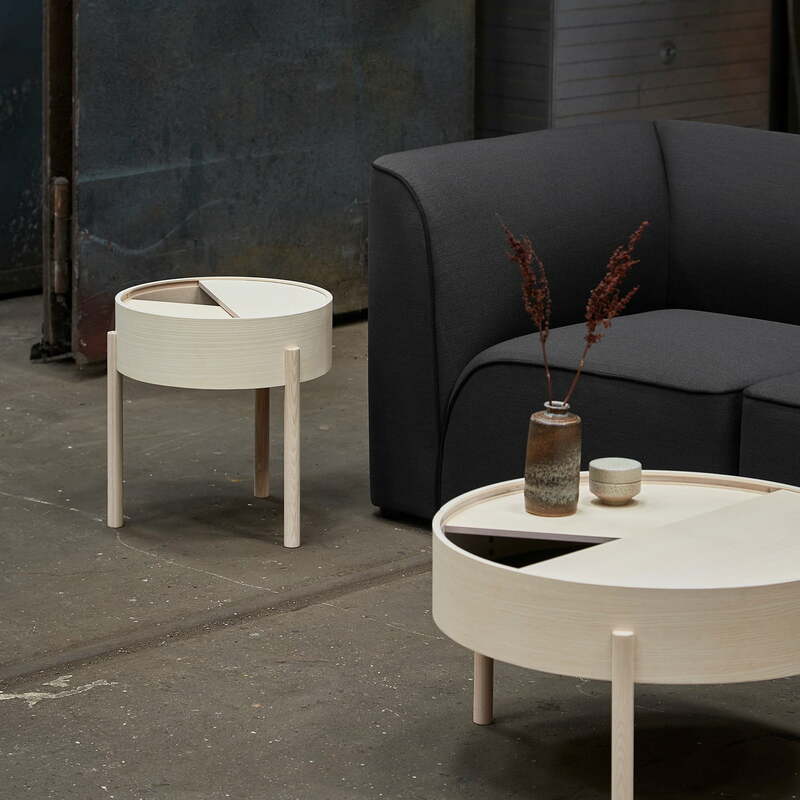 The small series of tables owes its name to the mathematical concept of an even curve connecting two points to form a circle. The Arc designers wanted to create a beautiful series of tables with plenty of storage space to hide their own chaos behind a stylish shell. This has resulted in refined and timeless tables with a practical use, which look great in front of and next to any sofa. The tables are made of ash wood. By simply turning one half of the round lid, the look of the table can be changed at any time. The surface of the interior storage space is covered with a smooth nanolaminate to complement the ash wood, while the three-legged construction gives the geometrically shaped design a playful and light touch. Inside the table you can store the remote control, books and much more, while on the tabletop vases and other decorative elements get a nice place. 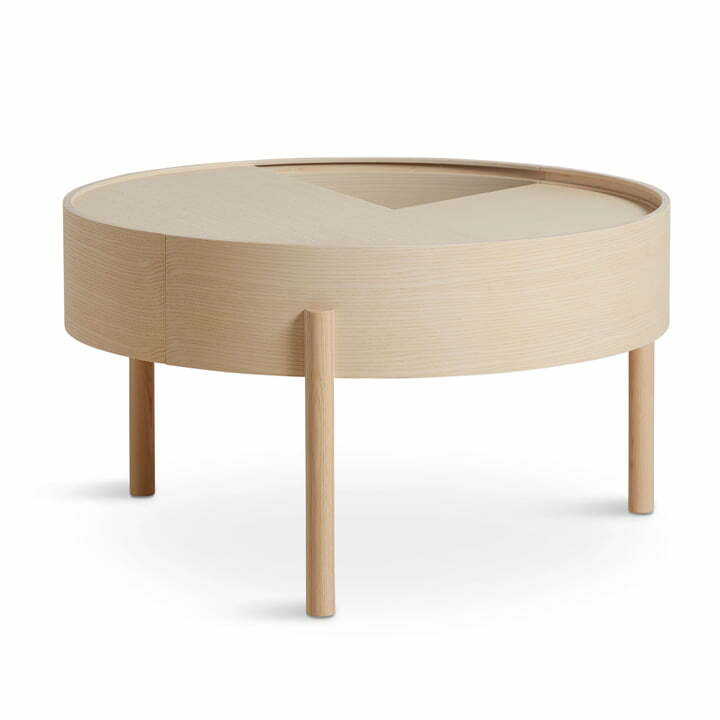 The Arc coffee table with a diameter of 66 cm and a height of 38 cm by Julie Begtrup and Ditte Vad for Woud in ash clear lacquered in single product view. 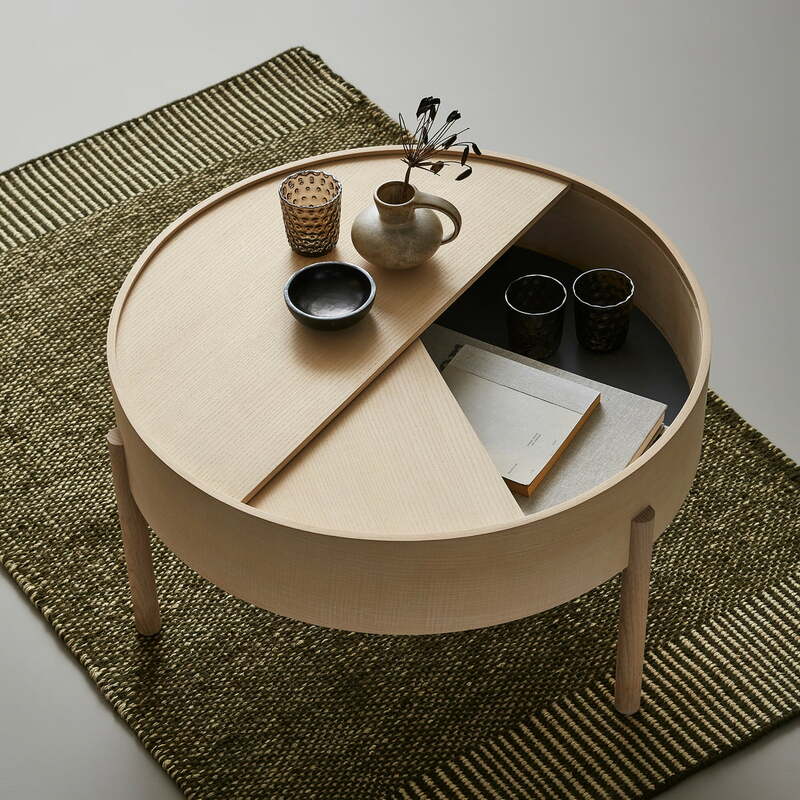 The Arc coffee table from Woud in ash clear lacquered made of ash wood. The look of the table can be changed at any time by simply turning half the round lid. The surface of the interior storage space is covered with a smooth nanolaminate to complement the ash wood, while the three-legged construction gives the geometrically shaped design a playful and light touch. 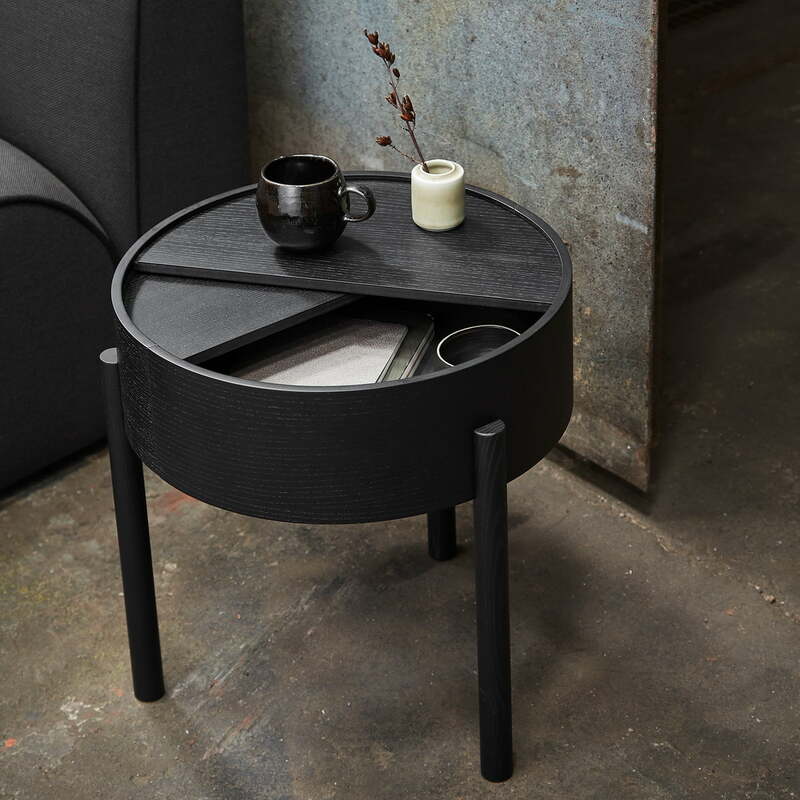 The Arc table by Julie Begtrup and Ditte Vad for Woud is available in different sizes as couch- or side table. 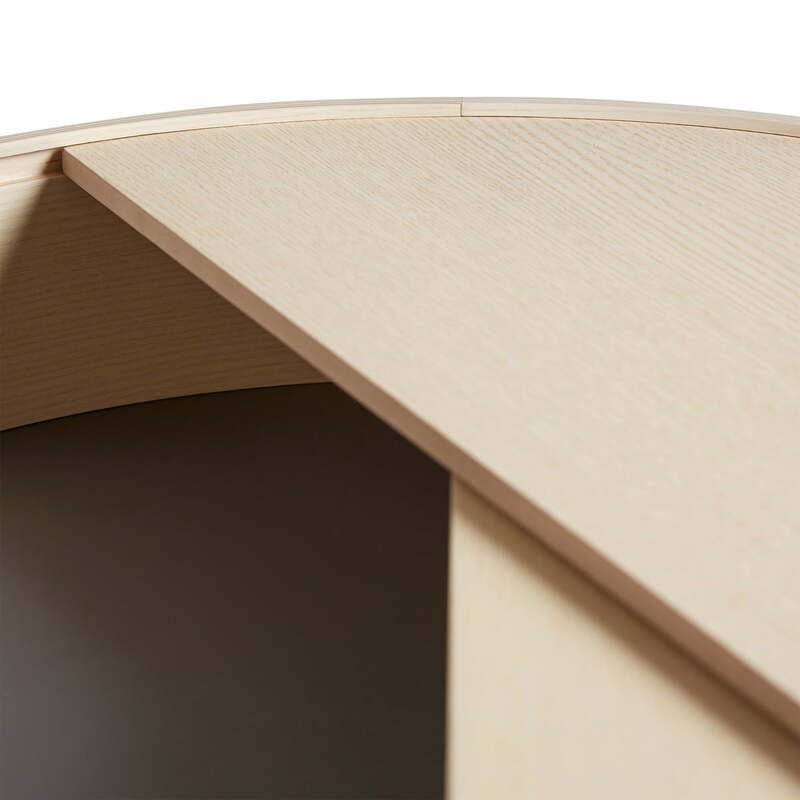 The small series at table takes its name from the mathematical concept of an even curve that connects two points to form a circle.